The Majority Of The World's 14 Million Cancer Cases Are Diagnosed In The Developing World : Goats and Soda That's the news from an analysis that maps out cancer hot spots. Developing countries are now struggling to cope with this growing threat. 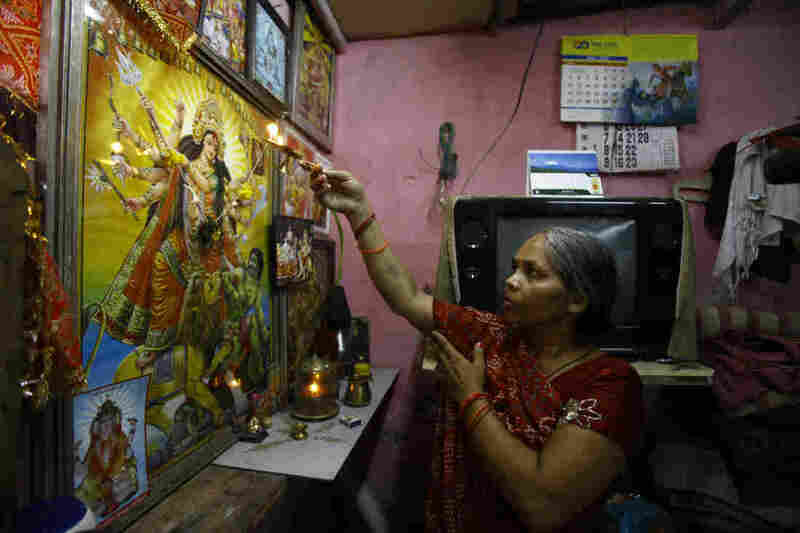 Usha Devi, who was treated for cervical cancer, prays at her house in Mumbai, India. Cervical cancer is one of the top four cancers in the developing world. The world has made a big commitment in recent years to treat and prevent infectious diseases like tuberculosis, AIDS and malaria. But another threat to global health is on the rise: Cancer rates are going up in the developing world. The majority of cancer cases — 57 percent — now occur in low- and middle-income countries. And 65 percent of cancer deaths worldwide occur in these countries, according to an analysis by the American Cancer Society. But there's a flip side to that story: Rates of certain cancers, including cervical cancer, have gone down in high income countries, according to the research published Monday in Cancer Epidemiology, Biomarkers & Prevention. "I wasn't all that surprised by what we found" says Lindsey Torre, an epidemiologist at the American Cancer Society who led the research. "We've been aware for a few years of the growing cancer trends in these low and middle income countries." The study looked at statistics from a number of sources, including the World Health Organization, collected through 2012. All told, there were an estimated 14 million new cancer cases in 2012, the study found. Researchers are still trying to work out why the number of cancer are increasing in poorer countries. "One of the biggest factors is likely just the growth and aging of the population in these countries," Torre says. The population in many countries is booming. "And as maternal mortality and infectious diseases are becoming less of a problem, people are living longer, which is great. But that also means they're living long enough to develop cancer." The study also highlights the lack of resources or infrastructure to fight cancers in many poor countries. Cervical cancer, which is the most common cancer among women in sub-Saharan and West Africa, can be easily prevented through vaccines for young men and women against the sexually transmitted human papillomavirus, which causes the cancer, and through regular screenings. And liver cancer, which often occurs in people infected with the hepatitis B or C virus, is less common in the U.S., where most people are vaccinated against hepatitis B. But liver cancer is one of the leading cancers in parts of West Africa and Southeast Asia. "In poor countries these cancers that are not only detectable but also treatable, are not caught early on," says Dr. Ami Bhatt, an assistant professor of medicine and genetics at Stanford University who wasn't involved in the study. In some cases, people with treatable conditions don't have access to the medication they need, Bhatt says. Two years ago, Bhatt and her colleagues headed to Botswana to help patients with chronic myelogenous leukemia — an uncommon blood cancer that's easily treated with a pill a day. "Due to politics and other issues, that pill was unavailable in Botswana. So patients who could live for decades with the right treatment had their lifespan cut down to less than five years." Global health groups fought and eventually won access to the required drugs for Botswana. "I wouldn't be doing this work if I wasn't optimistic," Bhatt says. "But I do think it's going to be difficult." The first step is to recognize that cancer is a huge problem in rich and poor countries alike, agrees Dr. Corey Casper, head of global oncology at the Fred Hutchinson Cancer Research Center in Seattle. This latest study is limited by the lack of good record-keeping in many poor countries, Casper points out. But cancer is undoubtedly a leading and growing threat, he says. "In sub-Saharan Africa, for every 10 new patients diagnosed with cancer, 9 will die," he says. The only way to flip those numbers, he says, is through better funding and smarter anti-cancer strategies.